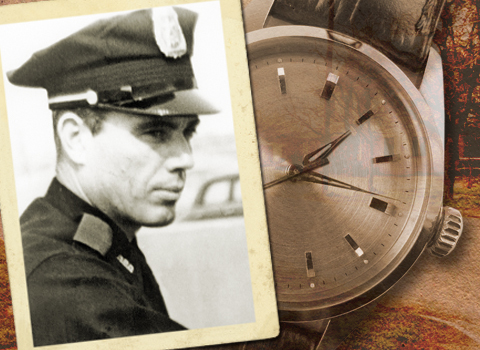 Fifty-four years ago, Dallas patrolman J.D. Tippit was shot to death on an Oak Cliff side street. The mountain of evidence that shows Lee Harvey Oswald guilty of the crime has stood the test of over five decades of scrutiny, cross examination, and rebuttal. In 2013, I published the second edition of With Malice: Lee Harvey Oswald and the Murder of Officer J.D. Tippit – a second-by-second account of Oswald’s horrific deed. Of course, the myth that Oswald was an innocent victim of a police frame-up continues to sputter along among a small cabal who are unable to recognize the truth or simple refuse to face it when they see it. Still, others prefer to perpetuate the myth for their own ego or financial gain by hiding pertinent facts from their audiences or simply harnessing the good old-fashion lie and riding it into the sunset, with a near certain belief that no one will be the wiser. One of the primary weapons in the conspirati’s arsenal of deception is the fable that Tippit was shot much earlier than acknowledged by official investigators – so early in fact, that Oswald couldn’t possibly have arrived at the scene in time to shoot Officer Tippit. In short, according to the myth-makers, the time of the shooting exonerates Oswald of any wrong-doing in Tippit’s death. Of course, not even the conspiracy crowd believes their own rhetoric on this subject given the fact that every book, magazine article, or website arguing Oswald’s innocence follows the “timing problem” with a list of other reasons why Oswald didn’t shoot Tippit. This exercise seems silly on its face, if the first argument were true. After all, if you could demonstrate that Oswald couldn’t possibly get to the Tippit shooting scene in time to commit the murder, then, there would be no further need of any additional evidence of his innocence, right? And so, in honor of the anniversary of J.D. Tippit’s untimely death and in the interest of establishing this one basic fact about the murder in Oak Cliff once and for all, I decided to lay out – once again – the pertinent details surrounding the time of Tippit’s death. Most of what follows was taken from With Malice where you’ll find plenty more about Patrolman Tippit’s life and death. May he rest in peace. This central tenet of the conspirati’s case for exonerating Oswald of the Tippit murder is absolute, unadulterated hogwash – as the facts below will clearly show. Given the fact that the time of death and the time of notification were clearly reported and documented contemporaneous with the events, how on Earth did this ever become an issue? Answer: The buffs. From the earliest days, conspiracy theorists keen to exonerate Oswald for Tippit’s death have argued that Tippit was shot as early as 1:06 p.m. and therefore, couldn’t possibly have covered the distance in the amount of time available to him. The “1:06 p.m.” shooting time originated from an affidavit provided to Dallas police by eyewitness Helen Markham. As it turns out, the commission was dead wrong about who contacted police and exactly when that occurred – more on that in a moment – although the commission’s main point was correct: Tippit was shot shortly before police were notified, which was well after the alleged 1:06 p.m. shooting time. Of greater interest is that fact that Mark Lane didn’t feel the 1:06 p.m. shooting time was of any real significance until 1966 – two years after he had acquired the affidavit that cites that time. Could it be that Lane himself didn’t believe Markham’s estimated shooting time? Over the last fifty years, the “1:06” shooting time allegation has grown to include three eyewitness accounts – Helen Markham, T.F. Bowley, and (belatedly) Mrs. Donald R. Higgins. None of their accounts holds up to even the most basic scrutiny. Markham’s time estimate is based on her recollection that as she left her home to catch her “usual 1:15 p.m. bus”, she stopped off in the washeteria, located on the first floor of the apartment building where she lived, to call her daughter from the pay phone. Unable to reach her daughter – whose phone was busy – she hurried out the door to the bus stop. She reportedly looked at the washeteria clock as she left. It read 1:04 p.m.
Based on the FBI’s timing, it would have taken Markham about two and a half minutes to walk to the corner of Tenth and Patton. Witnesses agree that the shooting occurred within a minute of her arrival – meaning Tippit would have been shot dead by 1:07:30 p.m. But, did it happen that way? As it turns out, the accuracy of the washateria clock was never determined; nor is it certain that Markham left her home as early as she claimed. The FBI determined that there was no “usual 1:15 p.m. bus,” as Markham claimed. The bus passed her stop on Jefferson Boulevard at 1:12 p.m. and every ten minutes thereafter. Presumably, Markham’s “usual 1:15 p.m. bus” was the 1:12 bus running a few minutes late. What is important is that Markham was a daily passenger on the “1:15 p.m.” bus and routinely walked the five-minute route. She would have been aware that, if pressed for time, she could leave as late as 1:10 p.m., and still make the 1:15 p.m. connection. And of course, she could always catch the next bus at 1:22 p.m. and still make it to work with plenty of time to spare. Additionally, Markham, who worked at the Eat Well Café on Main Street in downtown Dallas – a twenty-minute car ride (presumably a bit longer by bus) from Oak Cliff – didn’t start work until 2:00 p.m., which means that Markham could have left her home up to thirty minutes later than usual and still would have been to work on time. As you’ll see in a moment, definitive evidence pins the shooting time to about 1:14:30 p.m. – which means that Helen Markham probably didn’t leave her home before 1:11 p.m. Her late departure may stem from her eagerness to contact her daughter by phone before she left, and her knowledge that that the 1:12 p.m. bus typically ran a few minutes late. Critics have made and continue to make a big deal out of Bowley’s statement. But the reality is that while the accuracy of Bowley’s timepiece was never determined, one thing is certain beyond any doubt – the time that Bowley notified police. According to Bowley, he used the police radio to notify police of the shooting almost immediately upon his arrival – which by his own estimate, based on his activities, was within sixty-seconds of his arrival. Pages and pages of argumentative folderol have been written about the timing of Bowley’s radio transmission – most of them based on transcripts of the Dallas police radio traffic prepared by the Dallas police, Secret Service, or FBI. What the commission should have done was check the original recording that the transcript was based on. Had they done that, they would have discovered that nearly two minutes elapsed between the last verbal time check given by the dispatcher (1:16 p.m.) and Bowley’s notification of the shooting (1:17:41 p.m.). Even today, the Dallas police radio transcripts are cited by the so-called “research community” in an effort to raise questions about the events of November 22nd. Yet, every assassination researcher knows that the actual Dallas police recordings have been in circulation since June, 1969. Relying on transcripts to make any kind of argument at this point in time without consulting the original recordings upon which the transcripts are based is simply foolish. In addition to the Dallas police recordings, which establish Bowley’s notification time (and by extension, the approximate time of the Tippit shooting), three eyewitnesses telephoned police in the immediate aftermath of the shooting and two others made subsequent notifications. All five calls align with the timing of Bowley’s notification, providing overwhelming evidence that the Tippit shooting occurred shortly before 1:17 p.m.
L.J. Lewis, a wholesale car dealer and one of four men on the lot of Johnnie Reynolds Motor Company who heard shots and watched Oswald fleeing south on Patton, away from the murder scene, managed to get to a telephone first. Dispatcher Murray Jackson picked up the call sheet from the conveyor and read it, but before he could react, Bowley broke in on the police radio. The time was 1:17:41 p.m.
Nearly simultaneous to L.J. Lewis’ notification, came a second call. Mary Wright and her husband, C. Frank Wright, lived at 501 East Tenth, one block east and across the street from Tippit’s squad car. Frank Wright heard the shots, ran out onto his porch and saw Tippit just after he hit the pavement. Frank jumped off his front porch and ran down toward Tippit’s patrol car, as his wife, Mary phoned the police. Dallas police radio recordings show that the Dudley Hughes ambulance reported that they were en route to the scene at 1:18:38 p.m., arriving twenty-seconds later. The Hughes Funeral Home was just two blocks from the Tippit’s squad car. Fifteen seconds later, at 1:19:15 p.m., police broadcast Mary Wright’s address to officers racing toward the scene. Barbara Jeanette Davis, who along with her sister-in-law Virginia watched Oswald scurry across their front lawn as he unloaded his pistol, also telephoned police. Her address was broadcast by police at 1:21:18 p.m. In addition to these three eyewitness calls, two other witnesses placed belated calls that also support a shooting time of about 1:15 p.m.
William Scoggins, the cabdriver who saw Oswald walk over toward Tippit’s squad car, heard shots, and watched as Oswald hurried passed his cab, also called for help. Scoggins immediately jumped into the cab and tried to contact his dispatcher over his cab radio. The cab dispatcher told the FBI that he recorded the Scoggins’ call coming in at 1:25 p.m. During testimony to the Warren Commission, Scoggins noted that the ambulance arrived while Scoggins was in contact with the cab dispatcher. This would place the timing of the call considerably earlier, at about 1:18:59 p.m.
Robert and Mary Brock, a Texaco Service Station mechanic and his wife, telephoned police approximately five minutes after Oswald passed their Texaco Service Station, slipped into the parking lot behind the station, dumped his jacket, and disappeared in a westward direction. Dallas police first broadcast the Texaco Service Station address, 401 East Jefferson, at 1:21:28 p.m. If the Brock’s five-minute estimate is accurate, Oswald would have passed their service station at about 1:16 p.m., which, given the two-block distance between the shooting scene and the service station and the time required to traverse that distance, is in keeping with a shooting time of about 1:15 p.m. So, here we have five individuals whose efforts to notify authorities in the immediate wake of the Tippit shooting are well documented. In each instance, their efforts align with T.F. Bowley’s radio call which by his own testimony, was made within a minute of his arrival at the scene. A third eyewitness, Mrs. Donald R. Higgins, also claimed – albeit belatedly – that the Tippit shooting occurred earlier than thought by officials. In 1963, Donald and Margie Higgins managed several rented apartments in a home at 417 E. Tenth – 150 feet east of and across the street from the shooting scene. In 1968, three years after the shooting, Mrs. Higgins told an independent researcher that she was watching television when she heard shots. She jumped up, ran to the front door, and saw a police officer lying in the street and a man with a pistol running away from her toward Patton Street. When Margie Higgins first told this story, there was no easy way to check her claim against archival video tapes of the three networks that were broadcasting that day. Remember, this was long before the days of cable television and streaming video services, with hundreds of channels available. In 1963, you had three choices, and fortunately all three were recording what they were broadcasting for posterity. Given all of the evidence, it seems impossible to believe that anyone could reasonably reach the conclusion that Tippit was gunned down at 1:06 p.m., or 1:10 p.m., or anything in between. The contemporary record – and in this case actual recordings – make it crystal clear beyond any and all doubt that the shooting did not occur earlier than reported that weekend and certainly could not have happened as early as the conspirati have claimed for over five decades. To accept the timing suggested by the statements of Markham, Bowley, and Higgins, one would have to believe – and apparently there are a good number of conspiracy theorists perfecting willing to do so – that Tippit lay dead in the street for eight to twelve minutes before anyone bothered to notifiy police or call for an ambulance. Obviously, the claim that Tippit was shot at 1:06 p.m. is simply not believable. Is there any way to prove that Tippit was indeed shot at 1:15 p.m. as the press reported in 1963? The answer, is yes. It is clear that the actual shooting took place several minutes before T.F. Bowley’s 1:17:41 p.m. radio transmission. So, how much time elapsed between the shooting and Bowley’s radio call? The Warren Commission accepted eyewitness Domingo Benavides’ claim that he was the person who radioed police, even though they had an affidavit from T.F. Bowley, who also claimed responsibility. The commission could have used the Dallas police recordings to resolve the conflict in testimony, however, the recordings were never used for that purpose or to help establish the exact time of Tippit’s death. Had the Warren Commission looked into the matter, they would have found that the recorded transmissions from channel one of the Dallas police radio contained evidence that Domingo Benavides tried unsuccessfully to contact the police dispatcher for a period of one minute, forty-one seconds. This fact helps pin down the exact time the shooting occurred. Beginning at 1:16 p.m., a microphone is keyed a number of times on channel one of the Dallas police recordings, as if someone were “pumping” the microphone transmission button of a police radio. This continues for a little over 90-seconds, right up until the time passing motorist T.F. Bowley successfully contacts the dispatcher. Testimony indicates that these sounds relate to Benavides’ attempt to use the police radio. Because the sounds on the recording occur at the exact time of Benavides’ known attempts, and mimic those likely to have been produced, it is believed that these “fumbling” sounds are the result of Benavides’ attempts to use the radio. Consequently, the Tippit shooting must have occurred prior to 1:16 p.m., when the sounds first begin. The question is, how much earlier? Three years later during a CBS television broadcast, Benavides indicated that the time frame was much shorter. Benavides’ latter recollection – that the time frame was relatively short – is corroborated by the testimony of several other witnesses. Used car manager Ted Callaway, who was Benavides' boss, spotted Tippit’s killer approximately fifteen seconds after the shooting as the gunman jumped through the hedges adjacent to the house on the southeast corner of Tenth and Patton. This coincides with the moment the gunman disappeared from Benavides’ line of sight. By then, Callaway said that “four or five people had gathered, and a couple of cars had stopped.” No doubt, one of the vehicles was occupied by passerby T.F. Bowley, whose own testimony indicates that Benavides began working Tippit’s car radio at about the time he arrived. Putting Bowley's testimony aside, it is difficult to imagine that Benavides, who initially feared that the gunman lived in the corner house and might come back out shooting, would have remained hiding in his truck for very long given the presence of the gathering crowd and the arrival of his boss, Ted Callaway, at the scene. Considering the timing of the sounds heard in the Dallas Police radio recordings, and the corroborating actions of three witnesses, the murder of Tippit probably occurred about 90-seconds prior to Benavides’ bungled attempt to notify the dispatcher. Therefore, there is good reason to believe that J.D. Tippit was shot at approximately 1:14:30 p.m. The only remaining question is whether Lee Harvey Oswald could have gotten to Tenth and Patton by 1:14:30 p.m. to commit the crime. Nearly every book, article, and website promoting Oswald’s innocence claims that Oswald arrived at his rooming house at 1:00 p.m. and left three or four minutes later, citing Earlene Roberts as not only Oswald’s housekeeper but the timekeeper that absolves him of any wrong-doing in Tippit’s death. 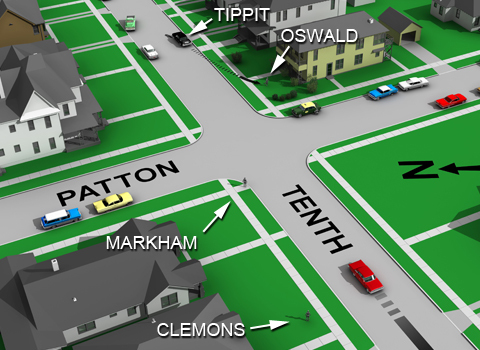 According to their argument, Oswald’s departure at 1:04 p.m. makes it virtually impossible for him to walk the eight-tenths of a mile between his rooming house at 1026 N. Beckley and the Tippit scene at 404 East Tenth in two to nine minutes (assuming that Tippit was shot between 1:06 and 1:13 p.m.). Yet again, as I explained in With Malice on pages 802-803, Oswald’s arrival and departure time at his rooming house in the wake of the assassination isn’t as clear-cut as the conspirati would have you believe. The FBI , Secret Service , and Warren Commission all timed various aspects of Oswald’s route between the Depository and the scene of the Tippit shooting. It is estimated that Oswald left the Depository 2.5 minutes later, at about 12:33-34 p.m. According to reconstructions, Oswald took 4.5  to 6.5  minutes to walk seven blocks to where he boarded a bus – arriving between 12:37:30 and 12:40:30 p.m.
Oswald remained on the bus four minutes , departing between 12:41:30 and 12:44:30 p.m.
Oswald’s four-block walk to the cab stand in front of the Greyhound bus station required three minutes , putting his arrival between 12:44:30 and 12:47:30 p.m. Early reconstructions timed the cab ride at 7 to 8.5 minutes  but had Oswald departing in the 500 Block of North Beckley. Cab driver William Whaley corrected the error, telling the Warren Commission that Oswald was let out in the 700 Block of North Beckley. The drive was timed at 5.5 minutes , which would put Oswald on Beckley in Oak Cliff sometime between 12:50 and 12:53 p.m. The walk to Oswald’s room from the 700 block of North Beckley required 5.75 minutes, placing Oswald’s arrival at his rooming house between 12:55:45 and 12:58:45 p.m. The length of time Oswald remained in his room is also uncertain. Oswald initially told police he changed his trousers and got his gun. Later, Oswald claimed to have changed both his shirt and trousers. It was also never determined whether Oswald had to take time to load his pistol. Each of these factors could affect the time Oswald spent in his room. It’s important to note that housekeeper Earlene Roberts felt the time Oswald spent in his room was very brief. 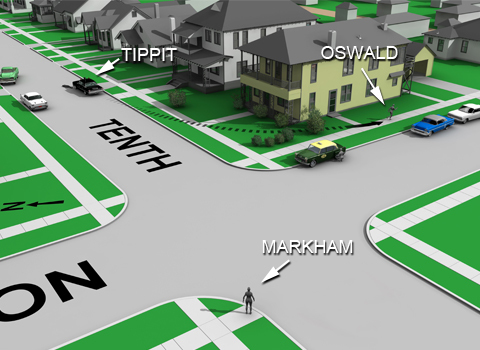 Potentially, Oswald could have been at the bus stop anywhere between 12:56:15 and 1:02:45 p.m.
Investigators estimated that it would have taken Oswald 12 minutes to walk the eight-tenths of a mile distance from the bus stop to Tenth and Patton. No one knows if he double-timed his walk or even ran part of the way. The thirteen-and-one-half minute total estimate would place Oswald at that location sometime between 1:09:45 and 1:16:15 p.m. It should be emphasized that there is a fair degree of uncertainty with respect to three areas of the official reconstruction – Oswald’s departure from the Depository, his arrival at the rooming house, and the length of time he stayed in the room. Still, it’s fair to say that the six-and-a-half-minute time spread calculated above is a reasonable estimate for Oswald’s arrival on Tenth Street. You’ll note that it was determined that Tippit was shot at approximately 1:14:30 p.m., and that his killer was first spotted ninety-seconds earlier, at about 1:13 p.m.
As the physical evidence presented elsewhere in With Malice demonstrates, it is more than a coincidence that the estimated time for the killer’s appearance on Tenth Street (1:13 p.m.) falls within the period Oswald had available to him (1:09:45 to 1:16:15 p.m.). It’s been fifty-four years since J.D. Tippit’s life was snatched from him on an Oak Cliff side street. For the better part of those years, JFK research conferences and Internet news groups looking into the assassination story have been largely populated by rabid conspiracy-minded individuals who pounce on anyone with opposing points of view and chase them off. Unfortunately, these actions promote stupidity. Free of being challenged, the conspirati’s arguments become weak, incoherent, and eventually irrational. Their inability to engage intellectually with the opposing side leads inevitably to name calling – lone-nutters, apologists, and worse. In a climate where public servants are the enemy, J.D. Tippit – a hard-working farm-boy, turned police officer and father of three – is twisted by radical elements into a racist, dirty cop, lurking behind the grassy knoll and conspiring to murder and frame an innocent warehouse worker. Tell that to one of J.D. Tippit’s surviving family members and you’re liable to get punched in the mouth. Unfortunately, the irrational among the conspirati aren’t satisfied with simply trashing a murdered public servant. For them, anyone standing in the way of their dream of exoneration for the self-admitted Marxist, Lee Harvey Oswald, is fair game too, and that includes eyewitnesses. And no one has been a bigger target than Helen Markham. Dallas police homicide detective, James R. Leavelle, who was the lead investigator on the Tippit murder case, told me that Mrs. Markham would have been a good witness until conspiracy buffs got ahold of her and turned her all around. There’s no question that the Warren Commission’s “star witness” in the Tippit shooting was destined to receive the brunt of the conspirati’s venom, no matter who it was. The fact that it turned out to be a sometimes confused and occasionally incoherent working-class waitress who got the unexpected shock of her life one afternoon hasn’t deterred those eager to find Oswald innocent from dumping on her at every opportunity. In many instances, she seemed to go out of her way to help them. So, it’s no surprise that conspiracy buffs have had a good ol’ time with Mrs. Markham’s credibility over the last fifty-some years. The low-point might have been when Warren Commission counsel Joseph A. Ball referred to Mrs. Markham as “an utter screwball” during a heated debate at the Beverly Hills High School, California, in December, 1964 – a phrase that has seen countless repetitions. Lane later wrote in Rush to Judgment that Mr. Ball’s characterization was in his view “unduly harsh,” though, no doubt, Lane had his tongue firmly planted in his cheek. It has become a foundational element of the conspiracy crowd’s mantra that Helen Markham is a completely unreliable and unstable witness – except for one thing – the time of the Tippit murder. When it comes to the 1:06 p.m. shooting time she postulated, Helen Markham is a truthful, reliable, and unshakable witness to Oswald’s innocence. The word “hypocrisy” comes to mind, but that would be too kind. I suspect that the truth about Mrs. Markham’s eyewitness account was lost long ago when she began hiding from so-called independent researchers who were focused on finding her, confronting her, and destroying her credibility at any cost. That’s scary enough. Still, we can only imagine the unfiltered horror she experienced as she watched the life cut out from underneath an innocent public servant going about the performance of his duties in broad daylight. That has got to mess with your mind. No matter what you think of Helen Markham’s shifting statements over the years, there is one moment that is hard to reconcile with the moniker of liar that the conspirati have hung on her. And that is her visceral and unconscious physical reaction to seeing Lee Harvey Oswald walk out onto the assembly room stage during a police line-up held just three hours and fifteen minutes after she saw J.D. Tippit gunned down in a barrage of bullets. All of the timings presented here and in With Malice were timed by the author at the actual locations. On July 19, 1964, during a New York radio interview on the Barry Gray Show, activist attorney Mark Lane dropped a bombshell – he had the tape-recorded statement of a previously unknown witness to the murder of Officer J.D. Tippit and that witness said Oswald wasn’t the killer! You won’t find the dirty little details about this story hidden among the thousands of JFK assassination documents recently released by the National Archives – the so-called “final release” – which so far has turned out, as Archive officials have warned us for many years, to be a big yawn. No, this story has largely been lying in plain sight among the millions of pages of documents that have been available to the public for the better part of forty-years – with one key exception: a transcript of the tape-recorded interview Mark Lane alluded to so many years ago. The witness he described turned out to be Acquilla Clemons, a Dallas care-giver whose statements about what she saw on November 22, 1963, became the centerpiece of Lane’s efforts to exonerate Lee Harvey Oswald for the daylight murder of Officer Tippit. However, as you’re about to find out, the real story is not what we were told. LANE: We now have a statement, uh, from another witness to the, uh, Tippit killing. This is a witness who has been questioned at our request by the Federal Bureau of Investigation. Months and months ago she was questioned. She is an eyewitness to the killing of Officer Tippit. To this day she has not been called before the Warren Commission to testify, and her statement is that she saw the killing of Tippit and two men were involved in the murder of Tippit, two men. One on each side of the street conversing with each other. Tippit got out of the car and walked toward one, this man pulled out a revolver, shot that man and then both of these men, who had been conversing before the shooting, ran in opposite directions. Thus far the Commission, which I assume must know of this testimony because we gave it to the FBI months ago and now we have given it to the Commission as well, the Commission has declined to call this eyewitness to the, this other eyewitness to the murder of Patrolman Tippit. LANE: – make reference to her. GRAY: Do you have a statement here with you? LANE: I am not in, uh, I do not have her permission at this time to release her statement but I hope that within the next two weeks I will be able to release her statement entirely. GRAY: To whom was her first voluntary, uh, statement made? LANE: To someone associated with our inquiry. GRAY: No, I, I don’t mean that, Mark, I’m, I’m talking about the FBI. Did she come forward shortly after November 22nd, and say I saw the killing of Officer Tippit? LANE: She stated this to Agents who came in that neighborhood and questioned her, yes. GRAY: And, has, have they gone back to interview her, to interrogate her? LANE: Yes, they have questioned her on more than one occasion. GRAY: And she has not been called by the Commission? LANE: She has not been called by the Commission. GRAY: And, uh, why does she suggest this be so, or what is your suggestion? It won’t surprise anyone familiar with Mark Lane and his penchant for twisting reality that hardly anything he had said about this newly discovered witness was true. 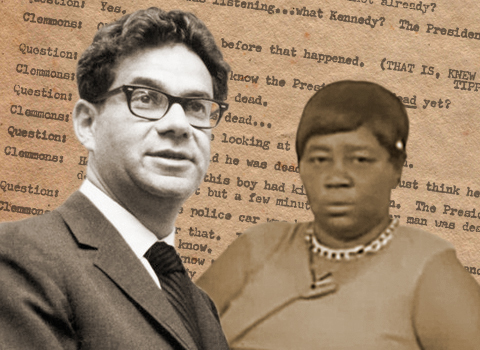 Mark Lane’s reference to Acquilla Clemons during the Barry Gray Show is a prima facie case of his willingness to sham the American public about the Tippit murder specifically and the Kennedy assassination in general. The “our,” above, is a reference to Lane’s “Citizens Committee of Inquiry,” a loose confederation of individuals with a singular purpose – undermine the case against Oswald in the JFK assassination. In a footnote to this charge, Lane wrote that on August 21, 1964, “the FBI denied in a letter to the Commission that it knew of the existence of [Clemons] whose evidence I had discussed at public lectures,” an apparent reference to the July 19, 1964, Barry Gray Show (during which Clemons’ name was not given). This, according to Lane, constituted the FBI’s awareness of the previous unknown witness! More importantly, there is no evidence that Lane, his associates, or any members of the Citizens Committee of Inquiry told the FBI (or any law enforcement agency for that matter) about Acquilla Clemons existence or what, if anything, she could have added to the Tippit case. Furthermore, there is zero evidence that the FBI interviewed Clemons “months and months” prior to Lane’s appearance on the Barry Gray Show. In fact, there is no evidence that any law enforcement agency ever interviewed Clemons. On October 12, 1964, two weeks after the Warren Report was released, the FBI finally learned the identity of Lane’s second female witness when The New Leader published an article by George and Patricia Nash, identifying her as Acquilla Clemmons (sic). So, in fact, Mark Lane had not informed the FBI of Acquilla Clemons existence months before his July radio appearance, the FBI had not questioned her several times as Lane also claimed, and the Warren Commission certainly couldn’t have called her to testify considering that they didn’t know she existed. But, Mark Lane knew, and so did several of his associates. During the following week, they met with Marguerite Oswald, toured the Tippit murder scene and other assassination sites, attempted to interview Helen Markham, and generally canvassed the area. As it turns out, the Nash’s assumption that law enforcement (specifically the FBI) must have known about Clemons is demonstrably false. As to the Dallas police investigation, the lead Tippit murder investigator, Detective James R. Leavelle, told this author practically the same thing many years ago – that he had plenty of eyewitnesses that were willing to come forward and give statements and that he didn’t need to spend valuable time searching for reluctant witnesses. Leavelle too had never heard of Acquilla Clemons until after the Nashes article came out. Lane later claimed that the interview was “tape-recorded in Dallas, August, 1964,”  although, this seems unlikely given Lane’s pronouncements on the Barry Gray radio show on July 19, 1964, in which he stated that he already had the tape-recorded Clemons interview. During the months that followed, while on his world-wide lecture tour, Lane insisted that witnesses to the Kennedy and Tippit shooting were being silenced as part of a government-led effort to cover up the truth. This is quite laughable given the fact that Mark Lane also knew of Mrs. Clemons existence as early as mid-July, 1964, and failed to inform the Warren Commission or law enforcement authorities so that she could be properly questioned. Still, Lane’s gift for deception goes much further. As you’ll see, none of what he told the Barry Gray radio audience is true. But who could possibly have known that? Shirley and Vickie Martin walked up to the front porch at 327 E. Tenth Street and knocked on the door. MARTIN: Hello. Are you Mrs. Clemons? MARTIN: You are? May I speak to you a moment? … We’d like to talk to you about what you saw on Friday, November 22. CLEMONS: I (can’t). It’s been too long. Mrs. Clemons immediately pleads that it’s been too long (over seven months has passed since the shooting) and that she can’t recall details. MARTIN: Well, has anyone talked to you and told you not to talk to anyone? MARTIN: Is that the Dallas police? MARTIN: Well, I’m just a private citizen. I’m not representing any group. My daughter is trying to write a children’s book. CLEMONS: They don’t allow me to say anything. I’m not allowed to say anything. The persons referred to as “they” is not explained – yet. Mrs. Martin digs deeper, looking for the sinister forces she believes are behind Oswald’s frameup. MARTIN: Who’s that? You mean the Dallas police? CLEMONS: Some of them. I don’t know. I don’t know one of them from the other. CLEMONS: I guess it was. I don’t know who. Somebody??? Mrs. Martin is practically handing Mrs. Clemons a villain – any villain – yet she bats each suggestion away like a foul-ball hitter. Finally, what I believe is the real truth tumbles out. This is the first ah-hah moment – one that has been hidden from public scrutiny for better than fifty years Here, for the first time, we have Mrs. Clemons explaining that it’s not a cadre of faceless, nameless law enforcement officers harassing her to keep quiet (as everyone has been led to believe by Mark Lane and the conspirati), but rather, a strong suggestion by her employers – John and Cornelia Smotherman – who are no doubt sick and tired of the parade of “journalists” (remember, this is the third visit in as many weeks) who keep showing up at her home. The Smothermans lived in the home at 327 E. Tenth in Oak Cliff. John died there in December, 1966, after suffering a cerebral hemorrhage. His wife, Cornelia, died in 1985. Later in the interview, Mrs. Clemons made it crystal clear that Cornelia Smotherman didn’t want her talking to anyone about the Tippit shooting. MARTIN: And no one… someone has come to you since those people came and told you not to give anything to the newspapers… well, I’m not with the newspapers. CLEMONS: I’m just not allowed to tell you. I can’t tell you nothing. I don’t know nothing. MARTIN: And have you been to the Warren Commission? In Washington? MARTIN: No? Did they come and take a statement from you or anything? So, again – the cops aren’t pressuring Mrs. Clemons to keep quiet. Her employers, John and Cornelia Smotherman, are the ones telling her to keep still. The real question is: Why has this exchange been literally excised from every account of the Acquilla Clemons story to date? At the very end of the interview, Mrs. Clemons did bring up a visit paid her by a “policeman,” however it was in reference to a part of her story that had nothing to do with the Tippit shooting itself or her glimpse of the officer’s escaping killer. According to the transcript, Mrs. Clemons told how Oswald’s mother, Marguerite, showed up with “some friends” one day to talk with her. This could only be a reference to Saturday, June 27, 1964, when Vincent J. Salandria and Harold Feldman canvassed the Tippit shooting area with Marguerite Oswald; the three later paying a visit on Helen Markham, who live one block north. The visit by Marguerite and her companions reminded Mrs. Clemons of something that happened on the day of the Tippit shooting. According to Mrs. Clemons, on November 22nd, while police were clearing the crime scene, a woman who looked like Marguerite Oswald pulled up in “a fine gray car” and parked, overlooking the crime scene. The woman remained there until “everything was cleared,” and then drove away. The woman’s resemblance to Marguerite Oswald was so strong, that Mrs. Clemons mentioned the story to Marguerite when she visited on June 27th and asked her if it was in fact her in the car that day? After the interview had ended, Shirley Martin and her daughter Vickie started to walk away, only to have Mrs. Clemons call them back. Mrs. Clemons again reminded them not to tell anyone that they had talked to her. CLEMONS: Because, I’m not allowed to tell anyone that I even seen her. CLEMONS: Because, you know, some kind of policeman talked to me. You know I don’t know one from another. MARTIN: Was it a plainclothesman? CLEMONS: No, he wasn’t plainclothes. MARTIN: He had a police officer’s uniform? CLEMONS: Had blue-looking clothes on. MARTIN: Had a star… badge? Mrs. Clemons never responds to the question of whether she was shown a badge, but clearly the man referred to by Mrs. Clemons as “some kind of a policeman” was not a uniformed officer. CLEMONS: And I’m not supposed to be talking to anybody, because he said if I talked to anybody I might have to go to Washington… be gone so long…be taking pictures of me. [Mrs. Smotherman] just don’t want that. MARTIN: Oh, I see. So, the police said you’d get a lot of publicity and you’d better not do it? CLEMONS: Yeah, I’d better not. Again, Mrs. Clemons is worried about being called away from her job to testify and the additional publicity that testifying would bring – both of which could jeopardize her job with the Smothermans. CLEMONS: Might get killed on the way to work. See I live over there. MARTIN: Is that what the policeman said? CLEMONS: Yes. See they’ll kill people that know something about that. There’s liable to be a whole lot of them. CLEMONS: There might be a whole lot of Oswalds and things. You know, you don’t know who you talk to, you just don’t know. CLEMONS: You have to be careful. You get killed. MARTIN: That’s what the police said too? Mrs. Clemons didn’t clarify who “they” are that told her to “be careful” and Shirley Martin didn’t ask. It seems a strange remark if in fact Mrs. Clemons was referring to the “policeman” who she described as a single individual who paid her one visit. Or could it be that Mrs. Clemons was repeating what Vincent Salandria, Harold Feldman, Marguerite Oswald, and George and Patricia Nash had told her during their visits just a few weeks earlier? It’s worth remembering that Shirley Martin’s interview of Mrs. Clemons was conducted approximately four months after Tippit witness Warren Reynolds was shot by an unknown assailant. Rumors were rampant that Reynolds was shot because of his pursuit of Tippit’s killer, a rumor that Mark Lane was eagerly promoting in his lectures, although Dallas police believed that the two events were not connected. LANE: Did anyone come and see you after the murder of Officer Tippit? CLEMONS: Yes, there was a man came with some cameras and talked to me and I wouldn’t talk to him and [he] left away. (emphasis added) Mrs. Clemons’ response wasn’t what Lane was hoping for, so he tried again. LANE: Yes. Did a police officer come to visit you after Officer Tippit was killed? CLEMONS: I don’t know what he was. He came to my house and talked to me, but I don’t know what he – looked like a policeman to me. LANE: He did? Did he have a gun? CLEMONS: Yes, he wore a gun. LANE: And did he say anything to you? CLEMONS: He just told me, uh, it’d be the best if I didn’t say anything because I might get hurt. LANE: Did he tell you it would be best if you didn’t say anything about seeing Officer Tippit killed or see the man with the gun? CLEMONS: No, no – he just said it would be best if I didn’t say I seen anything. LANE: I see. And, did he say he was from the Police Department? CLEMONS: He didn’t say; I didn’t ask him. Uh-oh! Mrs. Clemons’ answers didn’t quite fit the narrative that Mark Lane was attempting to build – one in which the Dallas police were threatening her to keep quiet about what she saw on Tenth Street, a charge Lane had already made – so he tried again. LANE: Did a man come and talk with you? LANE: Did he tell you what might happen if you did talk? CLEMONS: ‘Said that I might get hurt – or someone might hurt me if I would talk. LANE: About what you saw? CLEMONS: - what I saw. LANE: Mrs. Clemons, how long after Tippit was shot did this man with the gun come to visit you? So, to recap in a slightly more coherent manner, Mrs. Clemons tells Shirley Martin and Mark Lane that about two days after the Tippit shooting – Sunday or Monday, November 24-25, 1963 – a man wearing blue-looking clothes (but not a uniform), carrying cameras and wearing a gun, came to her home (she never explains how the man knew where she lived) and without identifying himself (she assumes he’s a policeman) asks to speak to her. She refuses to talk to him and he leaves, but not before he tells her that it would be best if she didn’t say anything because she might get hurt. And let’s not forget, that Mrs. Clemons initially told George and Patricia Nash a few weeks before Shirley Martin’s tape-recorded interview that the male visitor was from the FBI and that the agent only talked to her briefly but decided not to take a statement “because of her poor physical description,” she being a diabetic. As I’ve already pointed out, the FBI denied that they had made contact with Mrs. Clemons at any time in their investigation, would not have done so given that the Tippit shooting was a local matter, and (apparently, unbeknownst to Mrs. Clemons) even if the FBI had broken protocol and contacted her, there would still be a report of that contact. LANE: Did anyone come to see you after the murder of Officer Tippit? CLEMONS: Yes, he was a man, came, [CUT-A-WAY to LANE] I don’t know what he was. He came to my house [CUT to close-up of CLEMONS] and talked to me, but I don’t know what he – looked like a policeman to me. LANE: Mrs. Clemons, how long after Tippit was shot did this man with a gun come to visit you? CLEMONS: About two – about two days. [CUT to LANE] It was about two days, said that I might get hurt, [CUT to medium shot of CLEMONS] someone might hurt me, if I would talk. Regardless of Lane’s creative editing, it’s difficult to imagine that any law enforcement officer would have warned or threatened Mrs. Clemons with injury or death because of what she had seen – especially given the fact that she hadn’t really seen anything of consequence. You’ll recall that according to Mark Lane, Acquilla Clemons watched Tippit drive up upon two men conversing across the street from each other. Officer Tippit stopped his car, got out, and approached one of the men who pulled a gun and shot him. The shooter then waved the other man off and the two fled in opposite directions. Lane supposedly obtained all of this from Martin’s interview of Clemons. But, according to the transcript, that’s not what Mrs. Clemons told Shirley Martin. According to Mrs. Clemons, she was watching news of the Kennedy assassination on television. She grew tired and came out onto the front porch and sat down. A tow truck was hauling a wrecked car away from the corner of Tenth and Patton. The wreck was the result of an earlier accident in which a motorist, heading south on Patton, had gone off the road, knocked over the stop sign on the southeast corner, crossed the sidewalk, plowed through the bushes, and struck the porch of the corner house at 400 E. Tenth. This was the same house occupied by Barbara Jeanette and Virginia Davis – the eyewitnesses who saw Oswald cut across their lawn while fleeing the Tippit shooting scene. Police photographed the stop sign as part of the Tippit shooting investigation, but later determined that the two events weren’t connected. It is not clear from the transcript whether Mrs. Clemons returned to the interior of her employer’s home or was still sitting on the front porch, however, a short time after the tow truck left with the wrecked car, the shooting of police officer unfolded. Contrary to Mark Lane’s version of events, Mrs. Clemons did not see the shooting. She said she heard three shots. Mrs. Clemons looked diagonally across the street, toward where Mrs. Markham was pointing, and saw a man cutting across the corner lot at 400 E. Tenth as he unloaded and reloaded his gun. MARTIN: There were supposed to be two men weren’t there? CLEMONS: Well, it was two men. I don’t know, I wouldn’t know them if I was to see them. MARTIN: No, of course not. I wouldn’t expect you to do that. They were both on that same corner? Later in the interview, Martin asked Mrs. Clemons if she heard the two men “yell or say anything” to each other. This seems to contradict Mrs. Clemons’ earlier comment that “He (the gunman) was talking to a tall guy on the other side of the street”  As will be seen in a moment, Mrs. Clemons apparently surmised the supposed conversation from gestures the gunman made. Mrs. Martin asked Acquilla Clemons what happened to the man standing across the street after the gunman ran off. MARTIN: The other one went up that… Patton? Here, too, is another ah-hah moment – a sharp, left-turn off the path that we were led down fifty-three years ago. It is quite clear from the above exchange, that Mrs. Clemons didn’t think the man standing across the street from the gunman was an accomplice – as has been presented as a matter-of-fact by Mark Lane and virtually every person seeking to exonerate Oswald for the Tippit murder – but rather, that Mrs. Clemons thought the man might have been simply another eyewitness who, like her, ran away from the gunman in fear of losing his life. LANE: And was there any other man there? CLEMONS: Yes, there was one on the other side of the street, but I don’t know what is with him, or not. All I know, he told him to go on. Mrs. Clemons’ reply doesn’t make much sense as transcribed. It seems more likely, especially given what she told Shirley Martin, that what she meant to say is that “I don’t know whether he (the man across the street) was with him (the gunman), or not.” In any event, her reply didn’t fit the story Lane wanted to tell. He tried again. LANE: Did he motion to him? CLEMONS: He just looked at him and went on. LANE: Mrs. Clemons – er – the man who had the gun – uh – did he make any motion at all to the other man across the street? CLEMONS: No more’n told him to go on. LANE: And then what happened with the man with the gun? CLEMONS: Er – he unloaded and reloaded. LANE: And what did the other man do? CLEMONS: Man kept going – straight down the street. LANE: And then did they go in opposite directions? 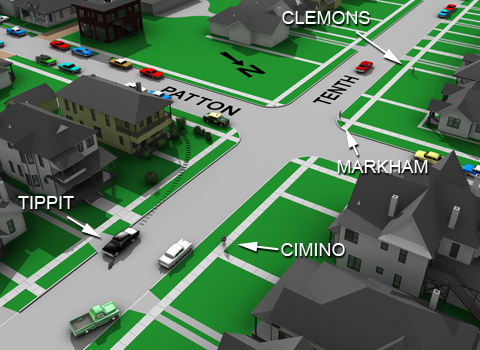 CLEMONS: Yes, there was one on the other side of the street. [DISSOLVE CUT] All I know is he told him to go on. LANE: Mrs. Clemons, the man who had the gun, did he make any motion at all to the other man across the street? CLEMONS: He unloaded it and reloaded it. CLEMONS: The man kept going, straight down the street. Once again, Mark Lane manipulates the Acquilla Clemons story – turning what Clemons herself thought was probably another eyewitness running for his life, into an accomplice in the Tippit shooting. There is corroborating testimony for Mrs. Clemons observation that places a man across the street from Tippit’s police car shortly after the shooting. Cimino jumped up, slipped on his shoes, and ran outside the house where he encountered a hysterical Helen Markham. She shouted at Cimino, “Call the police!” The waitress explained that a man had just shot a police officer and pointed in the direction of the alley between Tenth and Jefferson, off Patton. Cimino looked but could not see anyone. He walked over toward Tippit and saw that he had been shot in the head. Just then, people came running from all directions. We know from a multitude of cross-matching testimony, that as the two men ran off, Mrs. Helen Markham ran toward Officer Tippit’s body. What isn’t widely known is that Acquilla Clemons followed her. MARTIN: And you think the policeman died right away? Mrs. Martin asked Acquilla if she remembered which way Tippit’s car was facing – east or west? Oddly, Mrs. Clemons insisted that Tippit was shot “early in the morning.” Pressed as to the exact time, Mrs. Clemons explained that she usually ate lunch at 11:30 a.m., and that the shooting occurred before then. It’s clear from the transcript that not even Shirley Martin believed Mrs. Clemons’ timing of the shooting. Of course, there is ample evidence to show Tippit was killed at about 1:15 p.m., but don’t be surprised to see future bottom-feeders citing Acquilla Clemons’ statements as supporting evidence for a shooting time – any shooting time – that will exonerate Oswald from culpability. Two years earlier, during a secretly tape-recorded interview, Lane had badgered Helen Markham into describing the gunman as “a short man, somewhat on the heavy side, with slightly bushy hair.” He was all too happy to allow audiences to note the similarities between the two women’s description of the shooter – and in particular – that the description didn’t fit Oswald. CLEMONS: No. The other man (gunman) had on a jacket, but [unintelligible] it’s been so long. I don’t know. CLEMONS: One (the man across the street) had a white. I don’t know what the other one (gunman) had. But I didn’t pay no attention. I just tried to get out of the way because I thought he was going to shoot me – and I didn’t pay him any mind. I was getting out of the way. MARTIN: And the one with the gun had the white shirt on? MARTIN: And this man [with the gun] who ran this way, his top color was what? CLEMONS: I can’t remember. I was afraid. He frightened me. To come out and see him unloading his gun and reload it. MARTIN: He didn’t have a white shirt on? CLEMONS: I didn’t [unintelligible]. He may have had some bro – I don’t know. CLEMONS: The other one had on white – with the gun – I didn’t pay him much attention ‘cause I was getting out of his way. He acted like he wanted to shoot me. MARTIN: Was he a short, kind of heavy-set man? CLEMONS: Yes, he was short. Heavy. MARTIN: He was kind of heavy? CLEMONS: Yeah, he was kind of stocky-built. Stocky-build – whatever you call it. MARTIN: You wouldn’t say he was kind of thin? CLEMONS: No, I wouldn’t, ‘course he was just awful [fat or fast (the transcriber isn't sure which she said)]. I just saw him and I was getting out of his way. MARTIN: And did you notice his hair as all? Was it thick hair? Despite Mrs. Clemons repeated statements that she didn’t pay any attention to what the gunman was wearing or what he looked like, Shirley Martin managed to elicit from Clemons a description anyway – one that fit Martin’s own narrative of an innocent Oswald. Unfortunately, Mrs. Clemons description of a “stocky” gunman would have had more bite if Shirley Martin had allowed Clemons to describe the gunman on her own. But, apparently, Mrs. Martin couldn’t risk that, or resist the temptation to insert her own views into the historic narrative. If you strip away all the malarkey and manipulation that’s been added to the Acquilla Clemons story, one single cohesive picture begins to emerge. The minor details that she brings to the table about the murder on Tenth Street only support that which we already know to be true based on physical evidence and the testimony of a myriad of other witnesses – and that truth is that Lee Harvey Oswald murdered J. D. Tippit. When it comes to the malicious distortion of the truth for personal and ideological gain, few in the history of the assassination story have managed to crawl as low as Mark Lane. Heralded by a generation unwilling to confront his deceptions, dishonesty, and repeated cover-ups, Lane’s handling of the Acquilla Clemons story should serve as the primary exhibit of what lengths dedicated propogandists are willing to go to twist the simple, uncomplicated truth into a pack of fables that serve their own deceitful ends. Note: Kelin obtained the transcript from Shirley Martin and published only selected portions of it in his 2007 book, Praise from a Future Generation (pp.94-98). Note: In the transcript, Vickie Martin typed: “Her who?” next to this reference. Note: Upon a first reading, I thought that Mrs. Clemons might have attempted to use the police radio to call police, however, there is no corroborating testimony to support that notion, no reason to suppose that Mrs. Clemons would have been bold enough to make such an attempt, and more importantly, very clear that she was worried about being away from her patient, Mr. Smotherman, and did in fact return to the Smotherman home at about this time. It seems more likely, therefore, that she made an attempt to call police from the house, and simply misspoke during the taped interview.